Rachel entered our lives in December of 2002. We learned of Rachel from Paul Pennington with Family Life’s Hope for Orphans. Paul mentioned Rachel during a conversation we were having about starting orphan ministry in local churches. That same day, we also received an e-mail featuring Rachel as the “December Waiting Child” of the month. 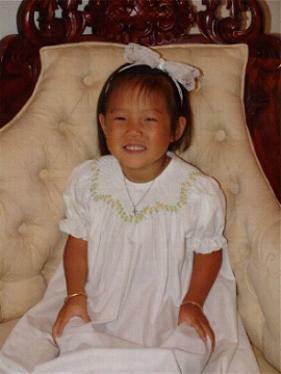 As we read about her plight with Arthrogryposis, clubbed feet and a congenital dislocated hip, the Holy Spirit placed her in our hearts. 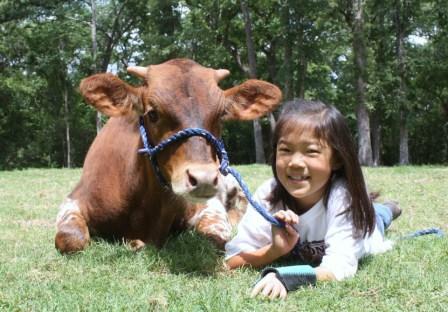 Rachel had been found in a train station when she was only a few days old. She was taken to an orphanage and by God’s grace and provision, an American nurse, who was familiar with her medical condition, found her. The nurse found a place for her to stay in a private foster care group home where she could get the care she needed so desperately. Although we felt the Lord was leading us to Rachel, we knew that we did not meet the strict criteria that China now requires. The family size limit was changed in 2001 to a maximum of four children in the family. We had eight children and so we felt it was not possible for us to even consider adopting Rachel. We spoke with several of our friends and tried to seek a family for Rachel. Children’s Home Society & Family Services told us that they had been trying to find a family for Rachel for over two years, but there was no family interested in adopting her. I tried to gather as much information about Arthrogryposis as possible. 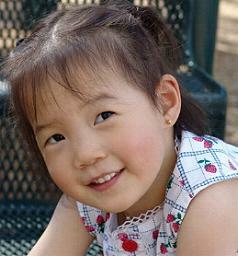 I found a beautiful website, that Barbara Burke did about her Korean daughter with arthrogryposis. It was a great source of encouragement to our family. We had no idea, at the time, that Barb would be the website designer for Forever Families. I do not believe it was by coincidence that our paths crossed. In January 2002, against all odds, we started the process of pre-pre-approval through the CCAA. 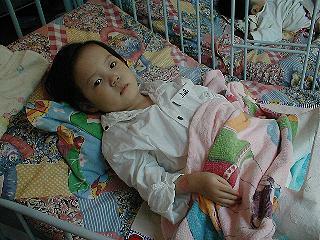 We fasted and prayed that God would soften the hearts of the Chinese officials who held Rachel’s future in their hands. 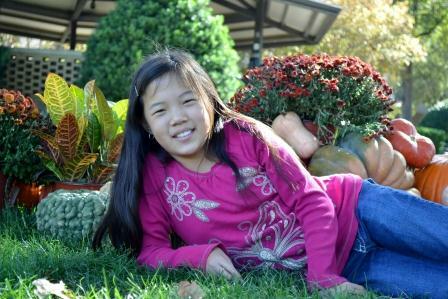 To our surprise, most of the Chinese officials said they would vote “yes” to our family adopting Rachel, but it would take a unanimous vote to make it possible. We were unsure what a few of them would say. Now that we had an answer, we were given permission to start our official dossier for China. We gathered the documents, completed an update to our home study and applied to BCIS for immigration approval. Within a two weeks, we had everything we needed except our BCIS approval. We went to have our fingerprints done and anxiously waited for the I-600A to arrive. Two months past and we still did not have the one piece of paper that was holding our dossier in the United States. We called many times to check the status our BCIS approval, but they just continued to tell us that they had up to four months to process our documents. We knew of several other families who were also adopting and had submitted their application after ours. When those families received the approval long before us, we began to realize that something was wrong and that our papers could possibly be lost. We had heard stories of this happening, but our experience with BCIS up to this point had been positive. Finally, Jay called the head of the Houston BCIS office and explained our situation. Within ten minutes we got a call from the office in charge of orphan petitions. They explained that we had not been fingerprinted and that our papers could not be processed until then. We gave them the date of our fingerprint appointment and when they searched their computers, they found that we had cleared that phase months before. She told us that we would have our approval by the following Friday. 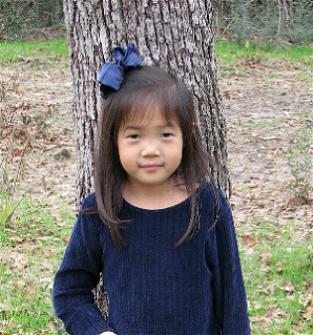 In September of 2003 we received an e-mail and photos from the lady who used to be Rachel’s foster mother. She sent us photos of Rachel on her third birthday. Rachel was living at the orphanage again because the foster care facility was forced to close and all the children living there had to be returned to the orphanage. 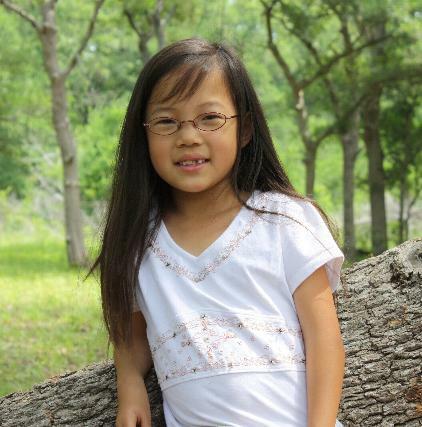 She had surgery to repair her dislocated hip the same week as her third birthday. She remained in a body cast for the following six weeks. It was difficult to accept that we could not be there to hold her and comfort her after her surgery or to help her learn how to walk. We were so thankful for the doctors from Stanford University who did her surgery. We prayed that she would recover quickly. We were so anxious to bring her home to her forever family. 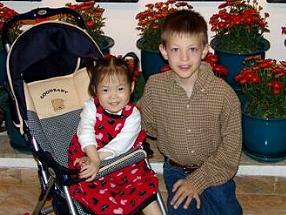 In December of 2004, we had been pursing Rachel’s adoption for over a year. At times it seemed very discouraging, but we tried to focus on the fact that God is sovereign and that He would bring her home in His perfect timing. It seemed amazing that we were back in the China program, where we first started our journey in international adoption, before moving to the India program in 1996. 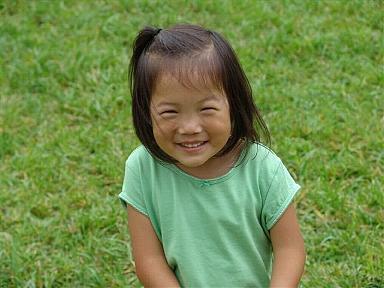 It was the plight of China’s little girls that first opened our hearts to adoption. The phone call we had waited for came in February. On February 12, 2004, we boarded a plane headed for China. We thought it would be a great experience for Jacob to travel with me to China. He was so excited! On February 13th, we arrived in Beijing. We went to the Great Wall the same day!!! It was exhausting, but fun! The following morning, we took a cab to Tianjin, the city where Rachel’s orphanage was located. We could hardly wait to see her. During the drive to Tianjin, Jacob and I were very surpris ed to see all the shepherds with their sheep grazing under the trees. We arrived at the Regency Hotel in Tianjin and met with the adoption coordinator. He was very kind and told us that he would be back in one hour to take us to the orphanage. It seemed like the longest hour ever. Then we headed for the orphanage. It was a large orphanage, but were not able to anywhere but into the offices at the front of the building. They said that Rachel was taking a nap and they went to go get her. When they brought her into the room, I was shocked to see how big she was and amazed at how much she reminded me of Lydia. She came to me immediately and loved the little bear I had brought with me. It had a photo of our family on its tummy. She looked at all the children and I began to tell her their names. If you have ever adopted before, you will understand what I am saying when I say that it was at that moment that all the “labor pains” left and I was finally holding her in our arms. The 15 months of waiting were well worth the wait!!! Rachel is a beautiful little girl, both inside and out. We are so blessed to have her as our daughter. When we first got Rachel, she did not have very good balance. When in the sitting position, she would fall back unexpectedly. She could walk when holding onto things, but fell frequently. She was able to feed herself with a spoon. Her tiny hands and slim fingers could pick up the smallest of items, but they did not have any strength to them. Still, she had a remarkable will to achieve whatever she set her mind to. One day, while waiting in our hotel room, I watched Rachel and tried to figure out why Rachel could not walk independently and fell so often. As I watched her play with Jacob, I noticed that one of her legs was about three inches longer than the other and that both of her legs were crooked. Her knees only bent slightly. As I watched her, I also noticed how determined she was to learn. Jacob did puzzles with her and she eagerly put them together correctly. We taught her all of her body parts in English and she seemed to pick up the language easily. On the third day, we took her to the zoo in Tianjin. S he loved seeing all the animals. Rachel had become very attached to me. She was also quite fond of Jacob. You could tell how happy she was by all of her smiles and laughter. Rachel struggled with over eating while we were in China. She would gorge herself on food until she became sick. We would have to limit her eating and there were times when she was irritated with us because of this. As the week past, she seemed to adjust better and now that she is home, this is no longer an issue for her. During Rachel’s first week home, she learned how to walk independently. She no longer falls when sitting, but still falls more than normal when walking. She even learned how to climb the stairs!!! She uses her elbows and chin to pull herself to the next step! She is so proud of all of her accomplishments. In a family with so many children, you may wonder how this precious little one could find her place. Well, let me assure you, she certainly has! She is closely bonded to all of her siblings. Miriam and Rachel have become best of friends, playing dolls and having tea parties ever chance they get. They both love to sing and we have enjoyed their “made up” songs. Rachel has taught us so much about “hope.” The blessings we have received through Rachel are immeasurable. Her laughter has filled our home with yet another precious gift. We praise God for the abundant love He has shown us through Rachel. Today Rachel is doing extremely well. She has already accomplished so much in short life. She was so determined to be like her other sisters that she danced in a ballet class for two years. She was unable to bend like the other girls in h er class, but her instructor said she had far more determination and ambition than any other child in her class. 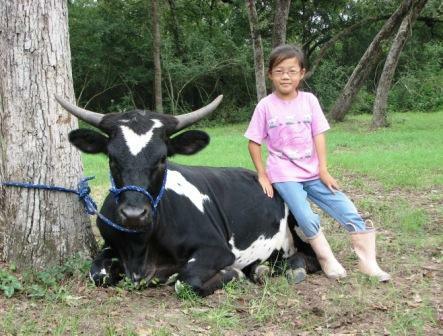 Rachel became involved in showing Texas Longhorns because she got tired of sitting in the stands watching her brothers and sisters have all the fun. It took us a while to find just the right steer for Rachel, but we finally found him and Rachel began showing independently at age seven. Although she still sometimes falls in the show ring, she pops back up and keeps going. It wasn’t long before she started placing in showmanship. 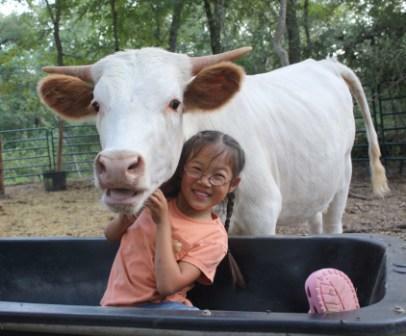 In 2008, Rachel was elected Junior Director for the Texas Longhorn Breeders of Tomorrow. The following year, she was re-elected and currently holds that position. She is very proud of her accomplishments, as she should be. Rachel is a highly motivated young lady in everything she sets her mind to. Rachel has the same approach to academics. She is not one to settle for mediocrity. She goes for the “A” every time! We are very proud of her.